The House of Representatives wrapped up legislative business today without considering articles of impeachment against Deputy Attorney General Rod Rosenstein, punting the potential showdown until September and affording the Department of Justice five more weeks to comply with a congressional subpoena. After nine months of incomplete compliance with oversight requests related to the Russia and Hillary Clinton email investigations, Rep. Mark Meadows, the chairman of the House Freedom Caucus, introduced an impeachment resolution on Wednesday night with 10 conservative colleagues. Meadows declined to force a vote on the resolution Thursday after he says he struck a deal with Judiciary Chairman Bob Goodlatte to postpone his next move until after the recess. Mark Meadows listens to testimony during a joint hearing with the House Judiciary and the House Oversight and Government Reform on Capitol Hill in Washington, June 19, 2018. While House Speaker Paul Ryan says he disagrees Meadows and other frustrated conservatives who introduced the resolution, he has supported their efforts to conduct oversight of the executive branch. “Do I support impeachment of Rod Rosenstein? No, I do not,” Ryan, R-Wis., said, warning lawmakers not to be “cavalier” with impeachment while further expressing doubt that the GOP’s showdown with the Department of Justice rises to the level of high crimes and misdemeanors. Rosenstein, the No. 2-ranked official at the department, oversees special counsel Robert Mueller’s investigation into Russia’s meddling of the 2016 presidential election after Attorney General Jeff Sessions recused himself last year. 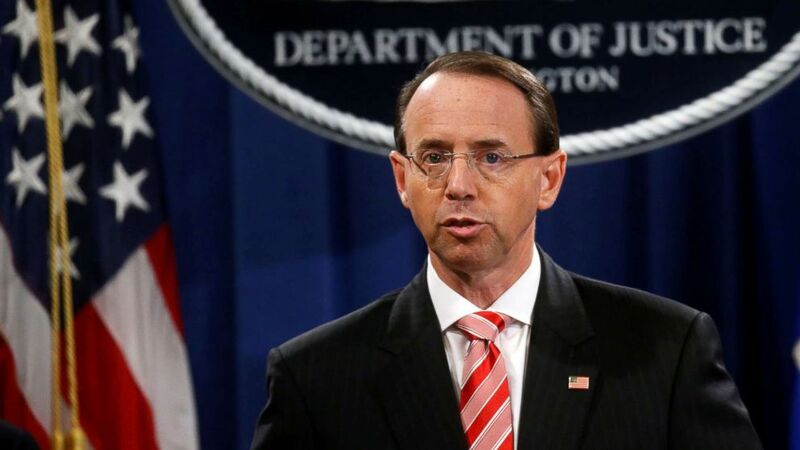 Deputy Attorney General Rod Rosenstein announces grand jury indictments of 12 Russian intelligence officers in Robert Mueller’s Russia investigation, during a news conference at the Justice Department in Washington, D.C., July 13, 2018. Rep. Adam Schiff, ranking member of the House Intelligence Committee, speaks at the University of Pennsylvania in Philadelphia,Feb. 1, 2018. Nevertheless, Republicans are heading home as the five-week recess begins without taking a vote on the resolution. If the department does not comply during the legislative break, Republicans may move to hold Rosenstein in contempt instead of voting to impeach him.